China's A-share Q1 earnings are in. According to the ISI Group, on a year-over-year basis revenue was up 10.4%, earnings increased 0.6%. Gross margin was 17.9%. As discussed before, there is anecdotal evidence that some of the corporate earnings may be "cooked", with inflation putting increasing pressure on margins. But even if you believe the numbers, the trend clearly points to a slowdown. 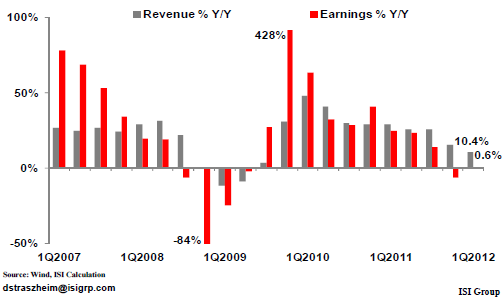 What's more, banks were the biggest drivers of earnings growth, totaling 56% of all A-share revenue increases in Q1. And that could point to a broader problem. The Economist: - The seven biggest mainland banks have just posted a 16% year-on-year increase in pre-tax profits between them for the first quarter. The level of non-performing loans (NPLs) remains low, at just about 1%. But trouble is being stored up for the future. There are two big worries: bad local-government debt and souring property loans. The infrastructure binge of the past few years saw a boom in local-government financing vehicles (LGFVs), off-balance-sheet entities used to get around prohibitions on borrowing. Regulators say these entities’ bank debts were worth $1.4 trillion at the end of September. Private estimates range much higher, and suggest that 20-30% may be non-performing. Not only have many bad loans been shifted to off-balance-sheet entities, but the government has been actively moving bad assets over to the so-called "policy banks". 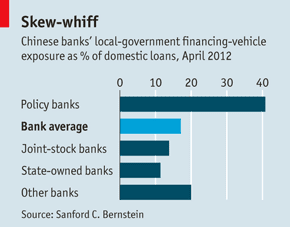 The Economist: - Another wheeze is shoving these loans onto the books of “policy banks” like China Development Bank (CDB), whose balance-sheets are now suffering. Half a trillion yuan, around $80 billion, in LGFV debt was rolled over last year from commercial banks to the CDB alone. China is clearly concerned about this state sponsored profitability at banks and the perception it creates - both domestically and internationally. CNBC: - "Frankly, our banks make profits far too easily. Why? Because a small number of major banks occupy a monopoly position, meaning one can only go to them for loans and capital," China National Radio quoted Wen as telling local businesses at a roundtable discussion. It is clear that this profitability in the banking sector is completely artificial, as bad loans have been "hidden" away. And that in turn raises questions about the profitability growth for the overall domestic equity markets in China as well as the rising risks in the "hidden" banking system.